there will be - within the "Feierabendspaziergänge" series of walks of the Rheinischer Verein für Denkmalpflege und Umweltschutz - a two-hour guided tour around the sculptures park Moltkeplatz. For further information (including a guided tour through the Moltkeviertel on 14 May) click into the picture or here ; additional information (including a guided tour in Werden on 09 July) here . you can find here . 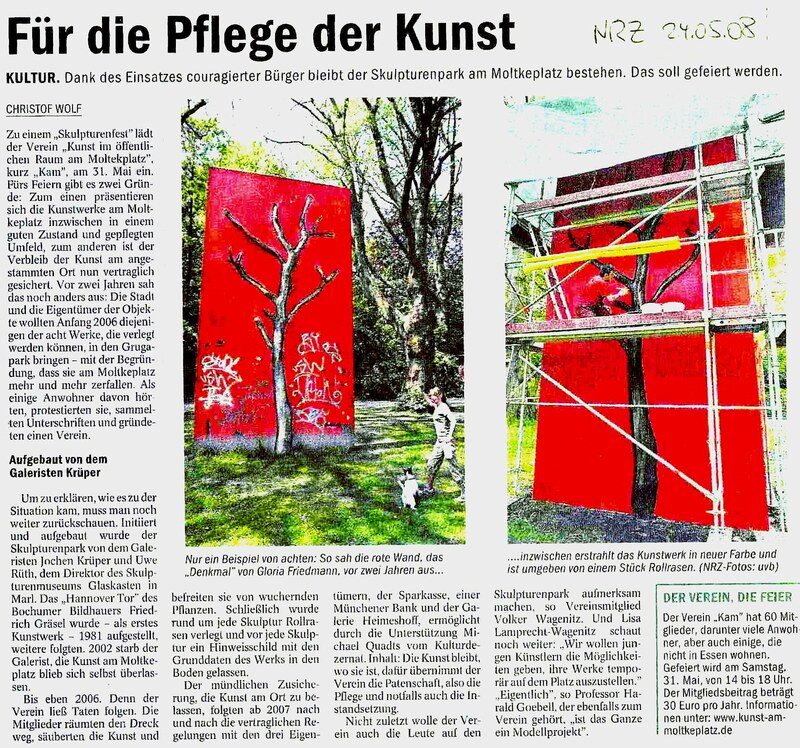 since 17 April 2019 the online issue of the coolibri magazine mentions the sculptures ensemble at the Moltkeplatz ... together with several other works of art in the Metropole Ruhr. On 28 March 2019, students of the UNESCO-Schule Essen exhibited their own temporary works on the Moltkeplatz under the title "Sculptures in Dialogue". These works were inspired by the permanent works of the sculptures ensemble. 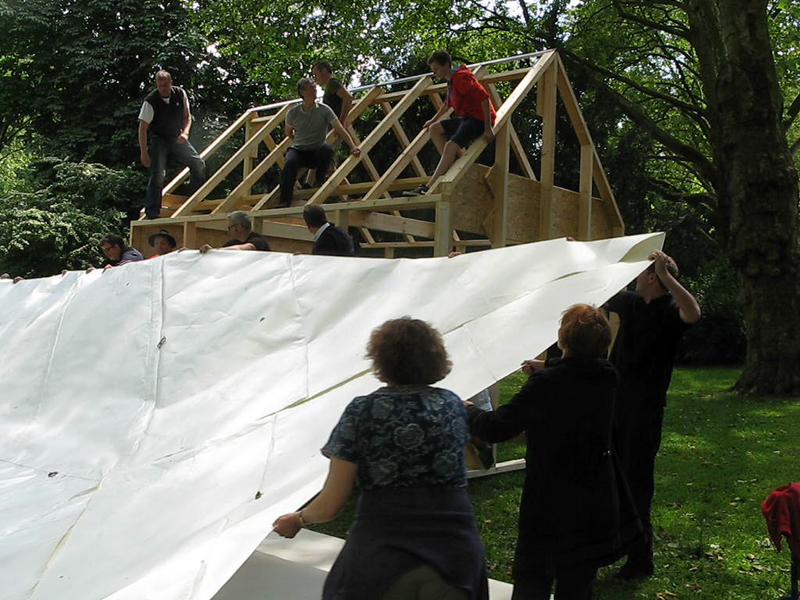 The students had dealt with them in their art classes together with their teacher Volker Ullenboom. This was the third such exhibition on the Moltkeplatz following similar events in 2016 and 2017. After some introductory words by KaM, the city of Essen Mayor Rudolf Jelinek welcomed the students of the UNESCO School, and all those present. This was followed by words by the head of the UNESCO School Silvia Lichtenstein, and of the art teacher Volker Ullenboom. Here are three of the exhibited temporary "Sculptures in Dialogue". On guided tours with the visitors, the students explained their works. More pictures and written information about all works here. The event was a cooperation between the UNESCO-Schule Essen and the association Kunst am Moltkeplatz KaM e.V.. More information here. WAZ/NRZ press article dated 29 March 2019 about the exhibiton here and here. The press office of the city of Essen reports about the event and the participation of the Mayor Rudolf Jelinek here. on 16 March 2019 KaM members and neighbours took part together in the 14th Action Spick-and-Span / Sauber Zauber campaign of the city of Essen. Despite the bad weather forecast for the day - which turned out to be much better than feared - eight people came together and - as in previous years - cleaned the sculpture park and the surrounding areas of rubbish and refuse. Glass and plastic bottles were just as much a part of it as discarded clothing, car parts and a lot of packaging waste. The action ended with a nice get-together. Various rubbish bags, well filled to various levels, were deposited at a central point for later collection by the city of Essen garbage collection service. on 15 Feb 2019 the twin exhibition "B1 - Constructors of artistic form" and "Konsortium - Triumvirat" was opened in the Märkisches Museum Witten. "B1" was a project by 10 artists from the Ruhr area from the late 1960s (before the B1 road was renamed to Autobahn A40). 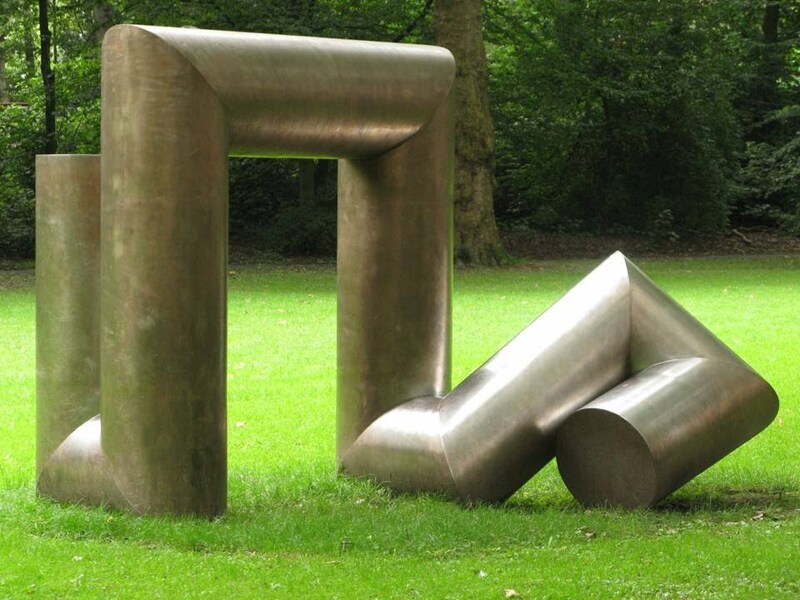 Friedrich Gräsel - whose work "Hanover Gate / Hannover Tor" has been on display at the Moltkeplatz since 1982 - was part of the B1 project; several of his works can be found in the exhibition in Witten. The artist group "Konsortium" has exhibited their temporary work "Korridor" on the Moltkeplatz during 2014-2015 within the series "young Art At The Moltkeplaz / junge Kunst am Moltkeplatz". During that time, a work by Friedrich Gräsel and Konsortium could be seen side by side. Friedrich Gräsel "Hanover Gate / Hannover Tor"
"Banquet Group / Bankett Gruppe 2, 2018" of Phung-Tien Phan: fenced-in area, and one single "being" (out of eight). On 16 Dec 2018, for the first time this winter, snow covered the sculptures ... for the first time also the temporary artwork "Banquet Group / Bankett Gruppe 2, 2018" of the artist Phung-Tien Phan. Unfortunately, after half a day the snow thawed, and the snowfall turned to rain. On 12 Nov 2018, a group of art students from the University of Duisburg-Essen, together with their lecturer Johanna Schwarz, visited the sculpture ensemble. During a guided tour the art works as well as their materials and surfaces were discussed and the peculiarities of art in public space were pointed out. The temporary artwork "Banquet Group 2, 2018" by the artist Phung-Tien Phan, which had been opened the day before as the seventh work within the series "young" Art at the Moltkeplatz was also discussed in detail. on 11 Nov 2018 the vernissage for the temporary work "Banquet Group 2, 2018" by the artist Phung-Tien Phan took place. 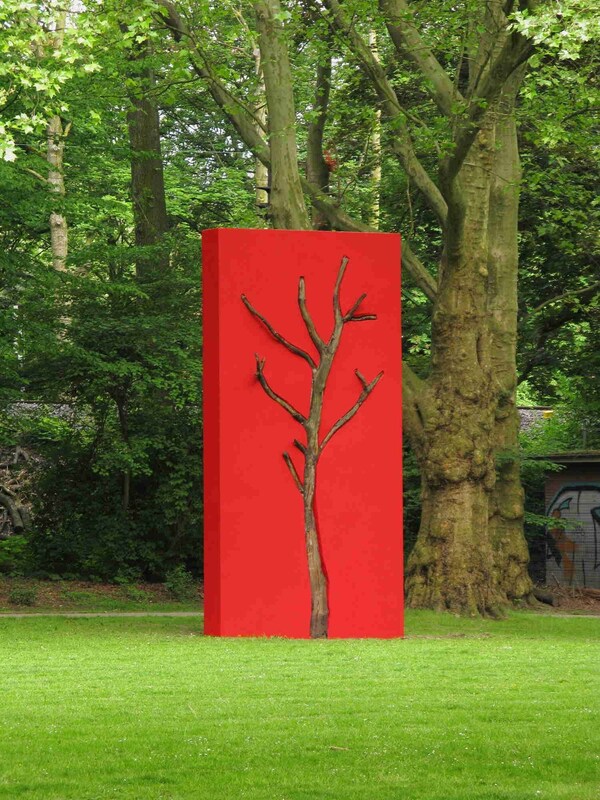 This is the seventh work in the series "young" Art at the Moltkeplatz which was started by KaM in 2010. The work, consisting of eight separate parts (= "beings") and a fence, will complement the ensemble of permanent sculptures until about Oct 2019. Read more about it here. Due to bad weather, the vernissage was "spontaneously" moved from the sculptures ensemble into the church of the Selbständige Evangelisch-Lutherische Kirche SELK, which was kindly made available by Pastor Klaus Pahlen. This project is sponsored and supported by Kunststiftung NRW, Allbau Stiftung and Sparkassenlotterie "PS-Sparen und Gewinnen"
The brochure documents the history of the Art Venue Moltkeplatz since its inception. It covers the time span from 1982 - when the first sculpture ("Hannover Tor / Hanover Gate" by Friedrich Gräsel) was erected by the Essen gallery owner Jochen Krüper - all the way to the temporary exhibitions of the "junge Kunst am Moltkeplatz / young Art at the Moltkeplatz" series initiated by KaM e.V. which was founded in 2006. More about the brochure here. An English language text-only version of the brochure is available here . Dr. Sabine Maria Schmidt führte in das Werk ein. Mehr zu Werk, Aufbau, Vernissage und Links zu weiteren Bildern und Informationen hier. Erwin Wiemer hat den Vorgang gefilmt und auf YouTube eingestellt; für den Beitrag klicken Sie hier. Mehr zu Werk, Aufbau, Vernissage und Links zu weiteren Bildern und Informationen hier. in dieser Woche hat Hannes Forster auf dem Moltkeplatz sein Werk Eine echte falsche Geschichte aus 1990 endgültig fertiggestellt. Die Auslegung des Innenraums des Werkes mit roten Ziegelpflaster war seinerzeit zwar geplant worden, ist aber erst jetzt - nach 22 Jahren - realisiert worden. Die Kosten für die Fertigstellung hat der Verein KaM getragen. Hannes Forster bei den letzen Schritten zur Fertigstellung seines Werkes. Als erste Maßnahme nach Abschluß des Patenvertrags hat KaM dies Kunstwerk auf Kosten des Vereins reinigen und restaurieren lassen. Gloria Friedmann hat sich am 25. Mai 2008 sehr positiv zu dem Ergebnis der Restaurierung geäußert. Lesen Sie mehr dazu in einem Artikel hier. Am Mittwoch 21. Juni 2006 verhinderte eine Gruppe Anwohner den Abtransport des Hannover Tors. Lesen Sie den ganzen Artikel hier. Fünf Jahre später, im Jahr 2011, wurde das Hannover Tor ein zweites Mal - nunmehr endgültig - für den Moltkeplatz "gerettet"... siehe unter "Highlight aus 2011" oben.